Decided to go short and say goodbye to your long romantic ringlets? Then we’ve got just the hairstyle for your short, curly hair. Boys may have their mohawks, but (like almost everything else) – girls do it better. 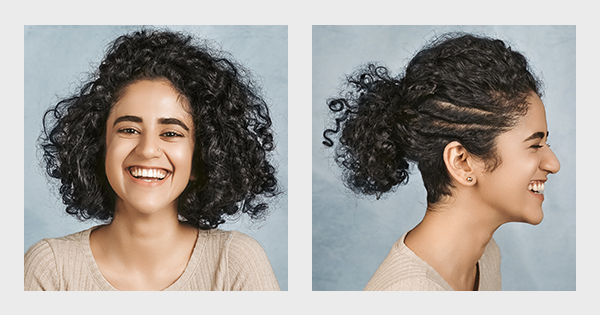 Adorable with a dash of sassy, a curly crop with undercuts* adds style, grabs attention and is much fun to experiment with. *No undercuts? No problem. This hairstyle for short, curly hair works without them as well. Step 1: Part your hair to the side, and clip the top part in place. Step 2: From the bottom, separate a section. Step 3: Twirl it, like you mean it. Pin it in place. (Start really close to your scalp so that the cornrows sit tight). Step 4: Twirl three more sections, similarly (or how many ever you want, really). Step 5: Repeat the twirls on the other side, and pin the top section to the crown. Step 6: Tie the bottom into a ponytail. And girl, you have made a simple hairstyle for curly, short hair from a simple ponytail with these trendy cornrows!